Turkey farmers have long used these bells to scare off predatory animals. They are also ideal for small pets (small dogs and cats) and as novelty noise makers. 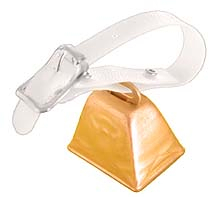 The bell comes with a polyethylene strap and is made of high-grade steel with a copper finish. Resembles a little cow bell.